"The Dark Knight Rises" - the conclusion to Christopher Nolan's "Batman" trilogy - is impressive in its enormity, a film in which its maker challenges himself by attempting to juggle roughly a dozen characters and several story lines at once, mixing a superhero's resurrection with politics, economics, terrorism, sustainable energy, and even the state of football concussions (loved the mostly throwaway moment of the doctor listing all of Bruce Wayne's afflictions). And while the visuals relish in their own grandeur, he still struggles with telling a story visually. I must stress just how talky this movie is. This is not necessarily a criticism of the recurring Nolan Exposition Quagmire - though, rest assured, that is present, particularly in the first act and late in the third when Marion Cotillard does exactly what she did in "Inception" and deliver a declarative monologue stacked on top of declarative flashbacks - but his penchant for failing to allow his characters to economize words. 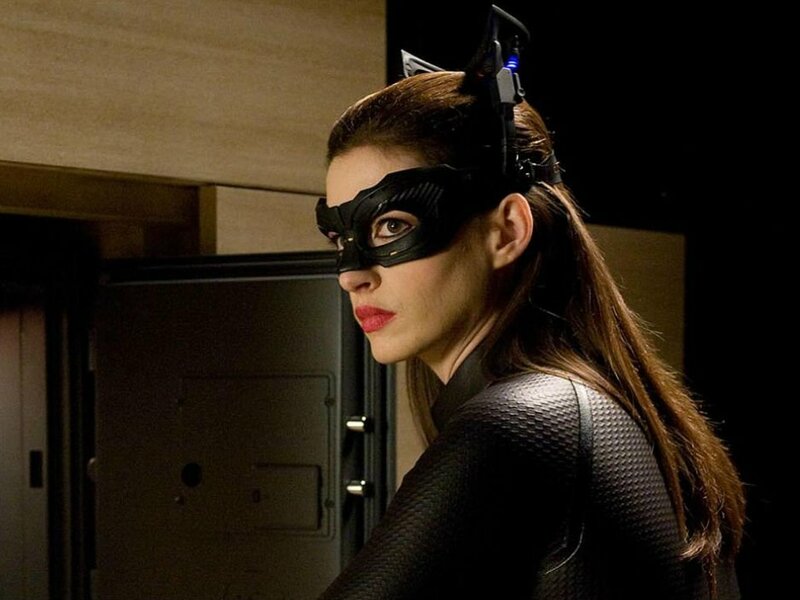 Let me give you an example: Selina Kyle (Anne Hathaway), an uber-skilled cat burglar, is on the prowl for a computer program that can erase her criminal past forevermore. It is called Clean Slate. Ahem. But when Batman/Bruce Wayne (Christian Bale) goes to hand her the computer program at a crucial moment he says - out loud! - that she must be looking for a fresh start and/or a new beginning. Uh, Chris! That's why it's called CLEAN SLATE! To symbolically REPRESENT a fresh start, a new beginning! You didn't have to tell us AGAIN! Yeah, that's just a few words, but when the writer routinely fails to properly edit dialogue exchanges or substitute a single image for a pile of words throughout, those extraneous words add up and presto! The pacing of the first hour feels monotonous even if it's technically moving fast. Then again, consider the charity ball where Bruce and Selina meet for a second time, share an obligatory dance and exchange crackling repartee that both advances the plot and sounds really, really good exiting the excellent actors' mouths. This proves that when Nolan (and his brother Jonathan, with whom he wrote the script) really focus they can make dialogue sing. Alas. And this marvelous scene makes me suspect that tucked within this sprawling gonna-be-an-epic-or-go-down-swinging is a 90-100 minute old school noir movie of near-classic proportions. Not to worry, though, because an apparently indestructible super-villain outfitted with a mysterious mask named Bane (Tom Hardy) is on his way to Gotham to turn it upside down before blowing it sky-high with a nuclear warhead. He gives Gotham to the lawless, easily thwarting a possible military presence, and allowing the 99% to run the streets while the 1% cower in their high-rises. Hathaway's Selina Kyle is the epitome of this class distinction, fancying herself as a Princess of Thieves, warning Bruce Wayne of the coming storm, but then failing to flee when it hits because she - unlike the hell-bent Bane - is an entrancing mixture of white knight and dark knight, shading whichever way the wind seems to be blowing. 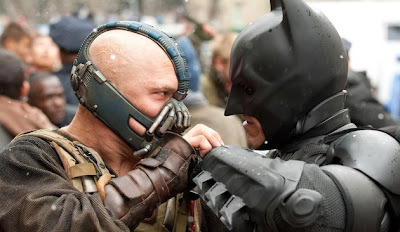 This sets the film up for a delicious superhero triangle between Batman, Catwoman (though she is never called Catwoman) and Bane. But that would have been akin to Joseph Gordon-Levitt (who is featured in "The Dark Knight Rises" in a role only necessary to pave the way for a reboot and/or extension of this film) turning up in "Inception" with merely the machine gun, Tom Hardy chastising him to "dream a little bigger, darling" and then revealing the grenade launcher. Nolan prefers the grenade launcher. He likes to "throw a lot of things against the wall to see if it sticks" (HIS words) but in crafting a story the storyteller should already know what he or she wants to stick. Nolan overloads the movie with Big Themes and then fails to afford them satisfying see-throughs - partly because his admittedly awesome ambition outweighs any conceivable possibility of doing so - and the final hour's mega scope is nothing beyond pure spectacle. It'll make you woot-WOOT, but it won't make you well up. Of course, for all its posturing as a socio-economic morality play, it's still a summer blockbuster in an environment where it is not good enough to be bigger than the last big movie, but to be the biggest. 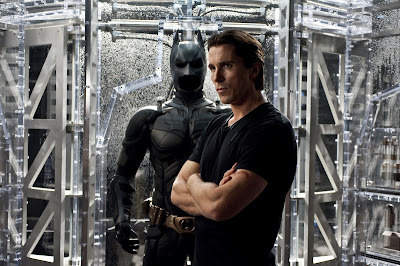 "The Dark Knight Rises" is most likely the biggest movie of 2012. Except its two hours and forty-five minutes and material contained within goes to show that biggest doesn't automatically make something best. Hi Nick, nice post! I think the extraneous exposition gets to be too much here, I agree. Btw, I included your post on AM about Nolan's 'set-ups and payoffs' thing in my review. Too bad there were quite a few throwaway moments in TDKR and stuff that are left to our imagination! I do feel that Nolan & co. dropped the ball a few times in this one. So yeah, biggest but not the best, but at least it still makes for a compelling trilogy of its own right. Thanks for the link, Ruth! 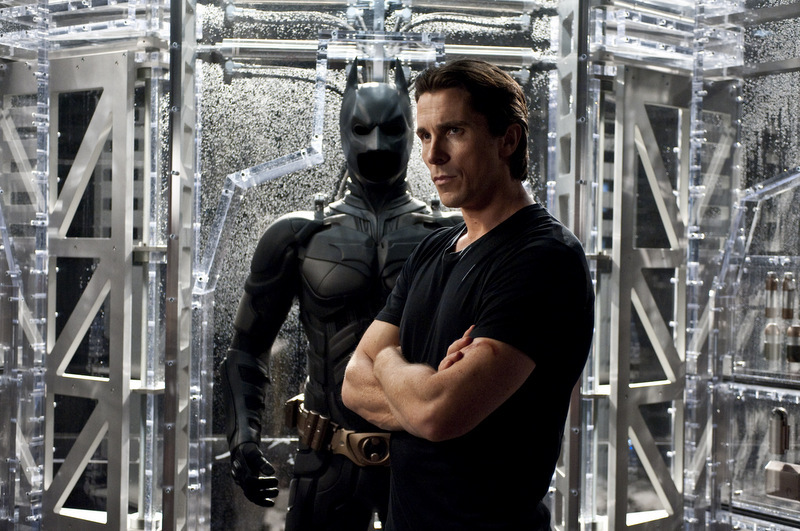 Nolan's films just never get to me emotionally, "Batman Begins" kind of excluded. And I guess, above else, that's what I want most out of movies which is why I guess I'm a bit cooler to this one than most. There were things I liked a lot, he just bit off more than he could chew. it's a blockbuster, but so much more. so well done and intricate. also, most of nolan's movies are wordy (which gives way ), but i think that aspect helps them be more than just a shoot 'em up action film. I do commend Nolan for this movie and for the others in the series - and for "Inception" too - in that he really does have ideas he's exploring. Whether I like them or not, he's fighting the good fight. I respect it.